3 Helen’s Way is a three bedroom two bath single family home with 1,192 square feet all on one level. 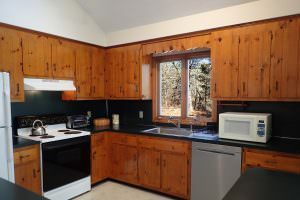 It is in a great Truro neighborhood and sited beautifully on a .83 acre lot. It has a full basement with internal and exterior access. 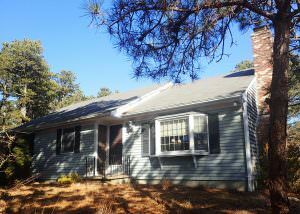 MLS REMARKS: Lovely three-bedroom two-bathroom Cape style home. 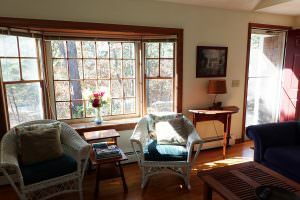 The living area has cathedral ceilings and skylights and a charming wood-burning fireplace. The open layout is comfortable for family living and entertainment. Large sliders open to the rear deck and a level yard, providing excellent access to outside activities. The master bedroom has an en-suite bath. There is another full bath in the center hallway. 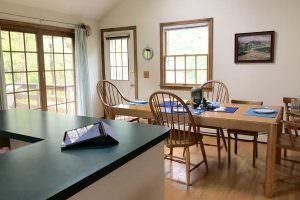 The kitchen is open to the living/dining area and has a large L shaped island. There is a washer and dryer in the full basement, and direct outside access. This terrific home is sited beautifully at the top of a knoll on close to an acre lot surrounded by pine trees and natural landscaping. A charming outbuilding provides extra storage. 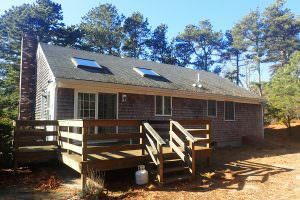 Situated in a bucolicNorth Truro setting, 10-minute drive to Provincetown, and close to both bay and Oceanside beaches. This home is ready for new owners to enjoy the summer of 2019, or as turnkey rental ready for summer season. Call for an appointment to see this great property.